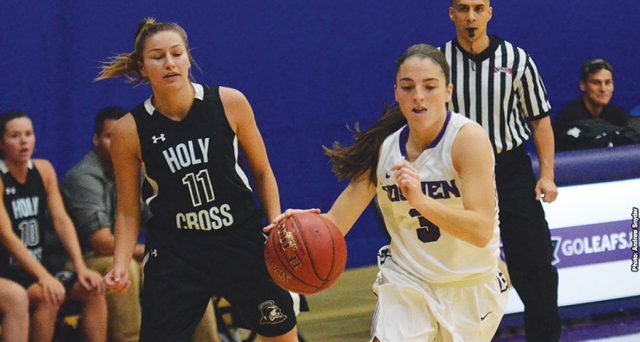 Goshen College’s first women’s basketball win of the 2017-2018 season came in dominating fashion as the Maple Leafs treated their home crowd to a 93-44 offensive and defensive showcase against visiting Great Lakes Christian College on Tuesday evening at Gunden Gymnasium. Two Maple Leafs set career highs in points and two more tied their career totals in the victory. Freshman Makayla Collier found her stroke behind the three-point line, knocking down a game-high three 3-pointers (all in the fourth quarter) to pencil in her new career best of 10 points, also adding career bests in rebounds, steals and assists. Senior Hanna Hochstetler posted a pair of new career high as well, dumping in six points of her own while adding five rebounds in 14 valuable minutes throughout the early-week affair. Taylor Roasa and Logan Kyre each set two new career bests, with each player setting an assist mark while Roasa added three rebounds and Kyre registered her first steal. Roasa and freshman Mariah Roe and turned in successful scoring evenings as well, matching their season and career bests with 14 and eight points respectively. For the second game in a row, Sydney Stein led Goshen in scoring, tabbing a season-high and game-high 18 points. She led the charge throughout the entire evening, going 6-for-10 from the field and a perfect 6-for-6 from the line to accompany her four rebounds and helping Goshen set season-best marks in field-goal percentage, free-throw percentage and rebounds. O’Neal was the fourth Leaf to find her way into double digits with 10 points and the only Maple Leaf to post a perfect mark from the floor, going 3-for-3. Donnae Lipinski and Hochstetler each missed only once, with Kyre cleaning up the offensive rebound and scoring off Hochstetler’s miscue at the halftime buzzer. Also of note in the star-studded affair was the carom-grabbing determination of GC center Keyaira Murff, who led all players with eight boards. In addition to the aforementioned retrieval performance from Hochstetler, four players finished with four boards: Goshen fetched a season-high 45. Murff also tied teammates Alyson Prigge and Haley Archibeque as a team-leader in steals with a pair apiece; Murff, Prigge, Kyre and Claire Rauck set new career highs in takeaways as the team posted 13. Goshen forced the Lakers into 21 turnovers, setting a new season high in that defensive realm for the second straight game. The Maple Leafs seemingly cured their early-season shooting woes, finishing the night an even 50 percent (35-for-70) from the field, 42.9 percent (12-for-28) from beyond the arc and 84.6 percent (11-for-13) from the charity stripe. On defense, GC held GLCC to just a pair of three-pointers and a 28.8 percent (19-for-64) tally as a whole from the floor. Goshen will look to build upon the win as it enters the second half of a four-game homestand on Saturday; the Maple Leafs will face IU Kokomo, which received votes in the NAIA national coaches poll, at 1 p.m.